A game by Astro Port for PC and Linux, originally released in Japan in 2013, and released in the US in 2015. Steel Strider is a sidescrolling mech combat game that serves as a follow-up to the developer’s prior mech actioner, Gigantic Army, once again focusing on the conflict between Terrans and Ramulons. 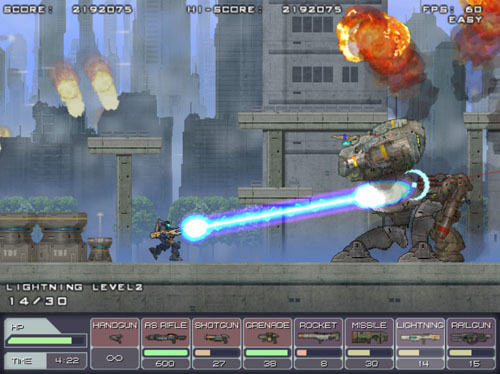 As in the previous game, the player controls a lumbering mech through a number of industrialized environments – with a somewhat muddy color palette – blasting robotic foes with a wide array of weaponry. New to this game is independent aim control, allowing players to use a mouse or dual analogue controller to aim in any direction while moving, which gives the game a faster pace than its predecessor. 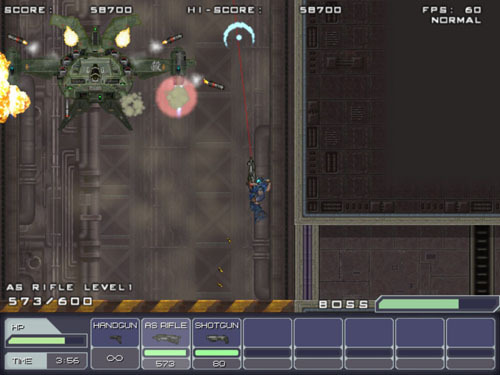 The game’s description places the action in “the second half of the twentieth century” – which would be between the 1950’s and the 1990’s – so this is likely meant be in the 21st century, given all the spaceships and mechs and whatnot. At any rate, a war has been waging across the entire galaxy, but it is nearly over. However, organized crime continues to flourish, and small skirmishes occasionally break out, but the local peacekeepers are ill-equipped to deal with these issues. Instead, a secret organization responds to distress signals, travelling undercover as a delivery service called Argo Express. In actuality, they transport a Gemini-class MCR, which stands for Manned Combat Robot (not My Chemical Romance), piloted by an operative who neutralizes galactic threats with extreme prejudice. 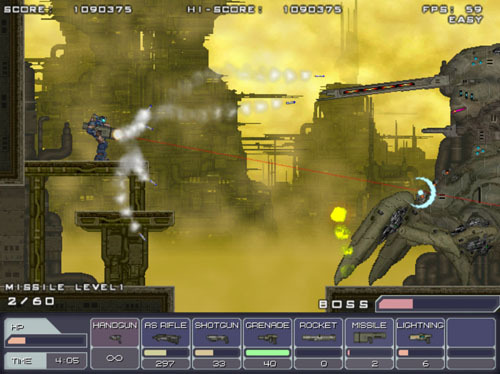 The sidescrolling mech combat genre was established by the likes of Target Earth and Cybernator (both part of the greater Assault Suits series), as well as Metal Warriors. There aren’t many classic examples of these sorts of games, but the genre has seen something of a resurgence of late, with the release of the aforementioned Gigantic Army, as well as Gunhound EX, Explosionade, and a modern remake of Assault Suit Leynos. Each of these games is united by slow-moving mechs with heavy firepower, and a focus on slower tactical advancement rather than running and gunning. Steel Strider gets off to a bombastic beginning with the armored Argo Express transport running down a few armed mechs and smashing through a reinforced door, and then spinning around and ejecting the MCR, which goes straight to work on blasting enemies. The mech has independent aim and movement, and it can fire while walking, ducking, or jumping. It also has an energy sword for dealing heavy damage to enemies (or crates) at short range, as well as a jetpack-assisted jump to allow a bit of extra airtime. 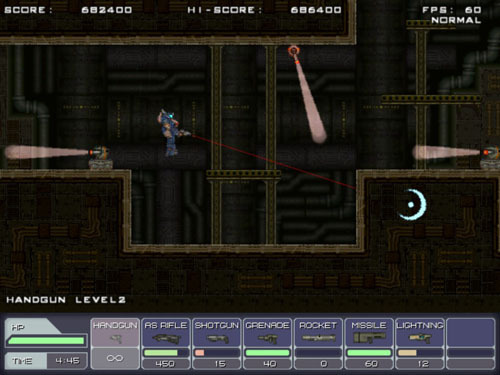 The mech begins the game with an infinite ammo pistol, but stronger limited ammo weapons are found along the way. New weapon drops appear frequently, encouraging players to make use of them rather than taking potshots with the weaker handgun. (A countdown timer also encourages players to stay on the move, but it's rare to run out of time in a level.) When a weapon is picked up for the first time, it is added to the mech’s arsenal, and picking up the same weapon again restocks its ammo. 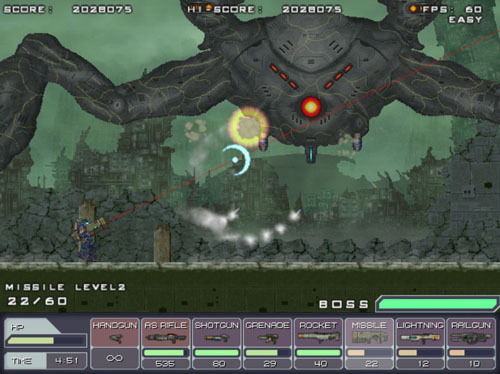 In later levels, players find upgraded versions of these weapons, which function in the same manner but have increased damage output. Weapons include an assault rifle that fires in short bursts, a shotgun that lets out a wide spray and is most effective up close, a grenade launcher that works well against heavy enemies on the ground, a rocket launcher for concentrated heavy damage against any type of enemy, a homing missile pod that fires off a few weaker projectiles that are great for dealing with flying enemies, a lightning weapon that delivers constant heavy damage in a straight line, and a rail gun that is very powerful but has a long reload time. 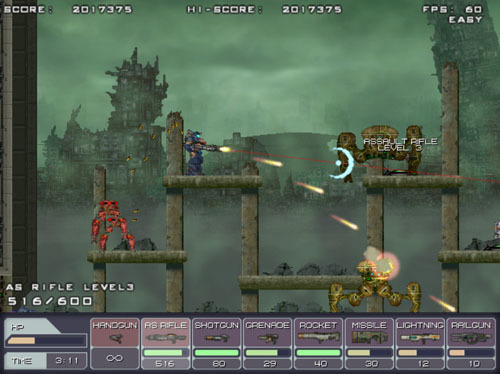 The list of weapons appears along the bottom of the screen, and a button press allows the player to cycle through them to the left or right. The game take place across four different planets, each split into a series of linear levels. The player has infinite continues, and getting killed returns him to the start of the current level, but he retains the amount of health he had upon entering the level. Health packs appear fairly frequently (on lower difficulty settings), but if players find themselves stuck, they have the option to return to the first level in the series to try again. Players can save the game at any time and reload a save to return to the start of that level (the game also auto-saves between levels). There are loads of enemies, as well as bosses and minibosses, so it can be quite challenging to make it from the beginning of a planet to the end, with most planets taking around 15 minutes to complete on a first attempt. However, the game offers four difficulty levels to tailor the experience to most skill levels. Most levels focus on moving left to right, or traversing underground tunnel systems, but gameplay is changed up from time to time to add a bit of variety. For instance, while most enemies are of the slow lumbering variety – intermixed with bigger foes that are even slower and lumberier – the player must occasionally face off against fast-moving foes, flying enemies, ones that crawl across the ceiling, and occasionally enemies that explode. In one level, you are tasked with making it through an area filled with surveillance drones and lights, and being spotted causes a bunch of turrets to pop up and shoot at you, so it’s best to avoid detection altogether. Another area features an escape sequence where you run across the top of a speeding train while attempting to outrun a giant spinning sawblade that shreds the train cars behind you. 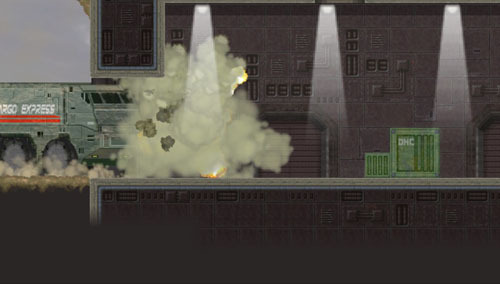 The third planet begins with a shmup sequence, transitions to a ground-based battle, and then moves underground. There’s even a boss that you fight while hopping between flying ships as they are smashed out of the sky, where falling spells instant death. Another area sees the mech standing on top of a long Argo Express cargo ship and fighting off waves of enemies before facing a boss and eventually getting shot down... crash landing to resume the fight on the ground below. Minibosses appear frequently and often feature agile foes – or ones that can kill you instantly – with a handful of attack types, but learning their attacks isn’t terribly difficult as you can apply the lessons you learned in previous levels to avoid attacks and provide a steady application of heavy fire to win the day. At the end of each planet is a proper boss battle against hulking monstrosities with long life bars and a wide range of attacks. It’s best to arrive at these fights with a healthy supply of ammo for your strongest weapons. 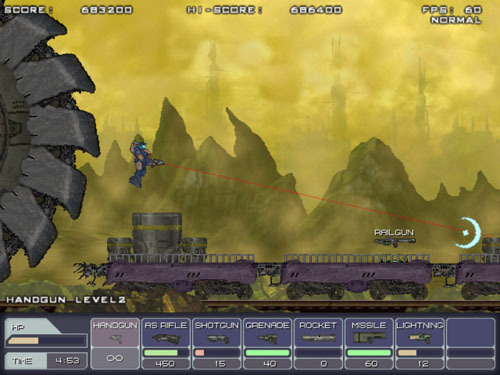 The game creates a sense of scale through a number of setpiece moments, such as the aforementioned sawblade train chase and sequences where players transition between ground and air battles. 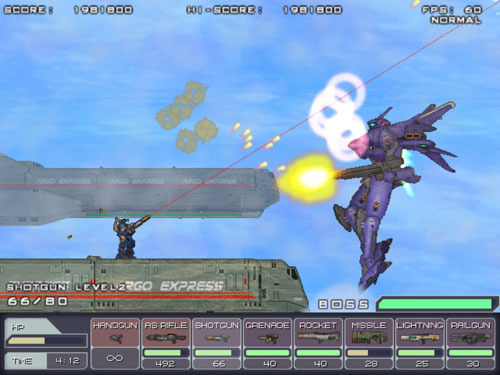 Sometimes the player will see elements of a larger battle taking place in the background, and in one instance, a huge mech is laying waste to allied ships in the background and then jumps forward to engage the player directly. This sense of scale is further enhanced by the requisite metal clunking of giant mechs and meaty explosions when enemies are destroyed. Steel Strider was developed by Astro Port, a doujin studio based in Japan. The game was originally released in Japan in 2013 and is a follow-up to Gigantic Army, which was originally released in 2010. 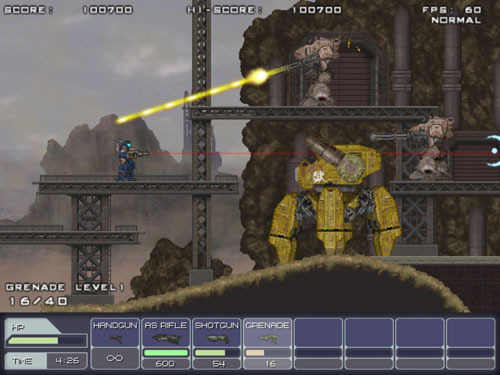 The studio also developed another mech combat game entitled Armed Seven (2009). 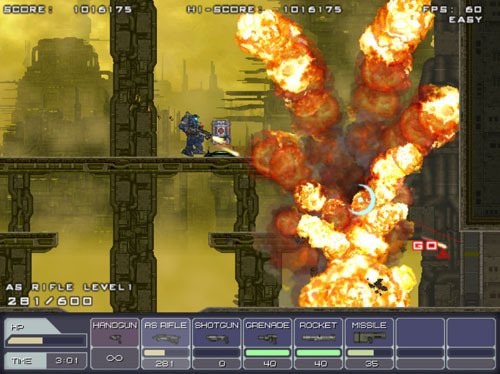 In addition, the studio has developed several shmups, including Wolflame (2013), Satazius (2011), and Supercharged Robot Vulkaiser (2009), as well as tank action games Adventum (2010) and Super Tank Warfare: Adventia (2012). The game was published by Nyu Media, which focuses specifically on doujin releases. In addition to publishing several of Astro Port’s titles, Nyu media published Yatagarasu from developer PDW: Hotapen, RefleX from developer Siter Skain, and Eryi’s Action from developer Xtal Sword.